The mystery shopping sector has been plagued with scams for years. But there are also many legitimate companies hiring mystery shoppers. Assignments can pay a few dollars to $20 or more. Here are five companies hiring now. BestMark offers 10,000+ mystery shopping assignments every month, the company says. Clients include restaurants, retail stores, hotels, resorts, casinos and more. They also hire Exit Interviewers to interview customers as they’re leaving stores. You must be at least 19, with reliable transportation. Sinclair Customer Metrics has been hiring Mystery Shoppers since 1987 and has over 200,000 mystery shoppers on its rolls. Assignments include telephone mystery shopping, video mystery shopping (videotaping inside the store), and conventional on-site jobs. More detail here. Market Force Information offers assignments in fast food restaurants, clothing stores, drug stores and many more. If you like movies, they also hire Theatre Checkers to watch trailers, critique sound and visual quality, count patrons, etc. IntelliShop hires telephone Mystery Shoppers, on-site Shoppers and others. Assignments can be found via its job board or app, or you can receive them via email. For more on getting the assignments, click here. 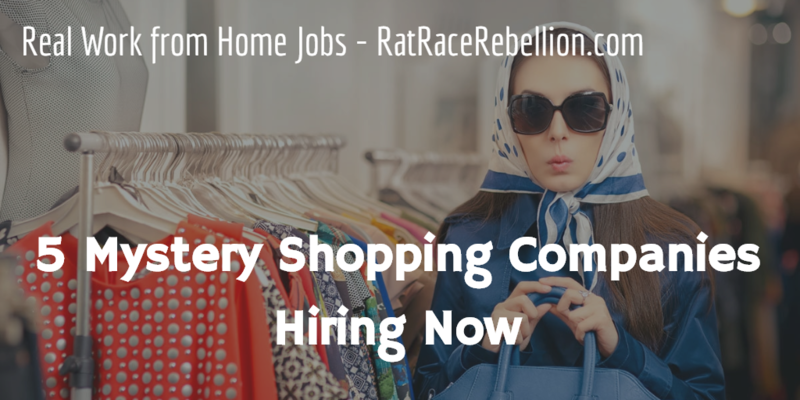 For more mystery shopping jobs, click here. For tips on spotting a mystery shopping scam, click here. This entry was posted in Earn Extra Cash, Mystery Shopping and tagged BestMark, IntelliShop, KSS, Market Force Information, Sinclair Customer Metrics. Bookmark the permalink.